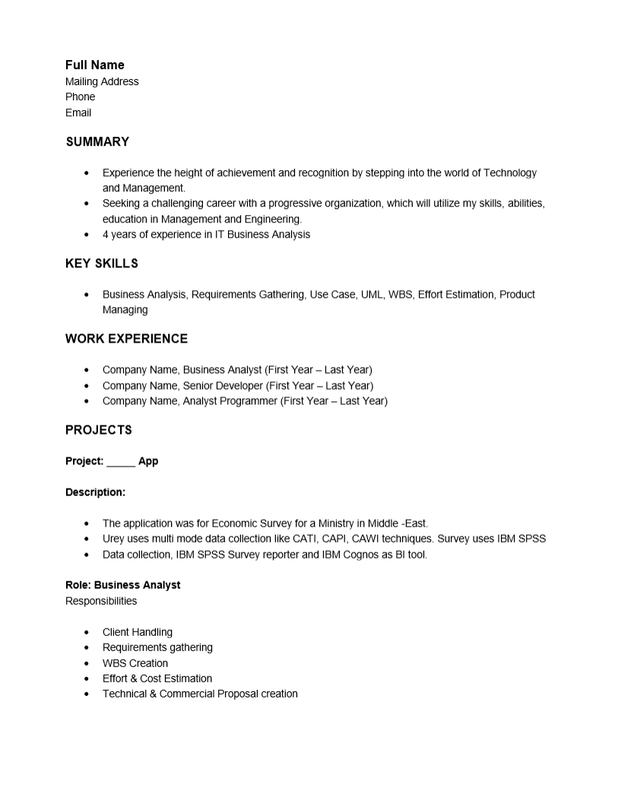 The IT Business Analyst Resume Template provides a standard format for a relatively new field. The IT Business Analyst recently came into existence in the early 21st century. As Information Technology has grown so has the demands and responsibilities placed upon it. This is no longer a separate department that aids the internal workings of interoffice communication and simple data storage but may be integral part of corporate growth. Nowadays, business analysts who are comfortable with technology may extend themselves to an IT department to aid in such areas efficiency, strategy planning, integration, and project management. This is a very specialized and demanding field which is defined by the company one is applying to. Thus one must be prepared to be versatile both in real life and on paper. This versatility may be achieved through the use of a resume form or a template. The basic use of a template is simple. There will be a set of areas where a user may input content. Each area or section will have a descriptive heading which acts as a guide for informing the user what subject to write about. This will create a master document specific to the template subject. This master document may then be used as is or a new template may be filled out with excerpts from it and new information specific to a goal. In the case of a resume template that goal would be to personalize a resume for the particular requirements and company one is applying to. This helps a candidate send an inquiry rather soon after seeing the job ad they are interested in. In the course of a job search, applicants should be ready to respond to an opportunity in as timely a manner possible with a top quality resume. This will greatly increase the chances of being considered a viable candidate by a hiring entity. Step 1. Enter your full name at the top of the page. Step 2. Enter your contact information directly below your name. Step 3. Write a summary about your professional experience and/or skill set. This may be placed in a bullet list if desired. There should be at least two or three facts about yourself that would convince the hiring entity you are sending the resume to continue reading. Step 4. 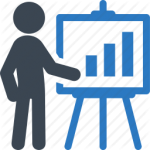 Make a list of your Business Analysis skills. This may be a very basic or broad list. Step 5. List your employers including your previous ones in the Work Experience section. List them in a reverse chronological order. List the projects you have worked on for each employer. Be very specific and make sure to mention your accomplishments. Step 7. Give specifics about any academic projects you worked on under the heading “Academic Projects” (if you have none omit this section). Step 8. Under “Educational Qualifications” list your academic credentials.